I like to think that there’s a retirement home for old League of Legends characters, where they are tossed when new and improved versions get added to the game. Sion’s probably in there, confusing his fellow residents by being a gigantic mage with an axe and smelling of rotting flesh. He’s in there because Riot have put together a new Sion, an unstoppable undead general. The new version of the old champion was revealed a couple of weeks ago, and now you can take a look at him in action with the latest Champion Spotlight. Sion’s a bit of a tragic fella, though you’d probably never know that from seeing him in the battlefield. I’m sure it’s not something that the majority of League of Legends players, or indeed MOBA players in general, want from the game, but god it would be lovely to see the lore and narratives that are attached to these champions appear in the game. 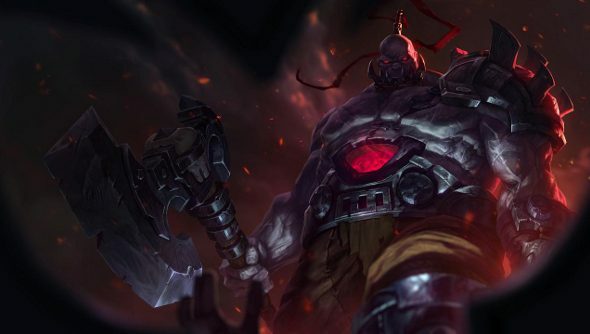 A lot of effort seems to go into them, but all we see when we look at Sion is a massive dude who does a lot of AoE damage.